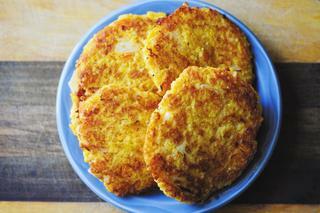 Delicious, healthy, and filling Butternut Squash and Millet Gluten-Free Fritters! simply put -- super delicious! Mix all of the above ingredients until evenly combined.Heat a greased (I use olive oil) skillet over medium heat.Spoon out ice cream scoop sized dollops, shape and flatten in your hands & place into your greased skillet. Cook 3-4 minutes each side, or until desired golden crispiness. Repeat with remaining batter.Let cool a few minutes before serving.Enjoy!